"Enjoy driving in a rally in the style of Carlos Sainz"
Rally games are a genre of gaming that hasn't really seen much activity at all. It's weird because most of the rally games that are released are generally really good, yet they haven't really caught on with the gaming community and have, as a result, not seen much in terms of development. One of the best rally games to date, named after a famous rally racer, Colin McRae Rally 3 sets the bar high for all other rally games that come after it. Colin McRae Rally 3 is one of the best rally games that exist at the moment. It contains countless circuits with different stages and types of ground and climate. There are many cars prepared specifically for Rally and you are able to play in different modes such as stages, championship mode or multiplayer. 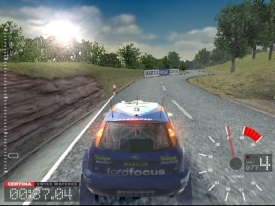 Not to have been outdone by rally games soon after its release, Colin McRae Rally 3 excelled in the graphics department with some players even going as far as to call them eye watering. For a game released several years ago, that's pretty good. Of course if you've played a racing game since Rally 3's release, you probably won't agree with them, but if you have been stuck in life a decade ago, this game will blow your mind. If you thought that you were just going to be handed the wheel and take off and go beat all of your friends with all of the vehicles unlocked and burning rubber, sorry. Unfortunately, not only is this a demo, but this demo version is just for one player and with one available car which is a Ford Focus. The great thing is that you have more than one map to race on. You can also choose between races in 3 countries: United Kingdom, Japan and Sweden (with snow, even better).